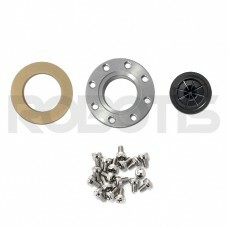 HN12-I101 is the standard idler bearing set for Dynamixel X-series 430 models. This idler bearing is connected to the opposite side of the output shaft of Dynamixel X, and can be used to assemble the hinge frame on it. Patented hollow structure enables this set to be assembled with Dynamixels without screws.